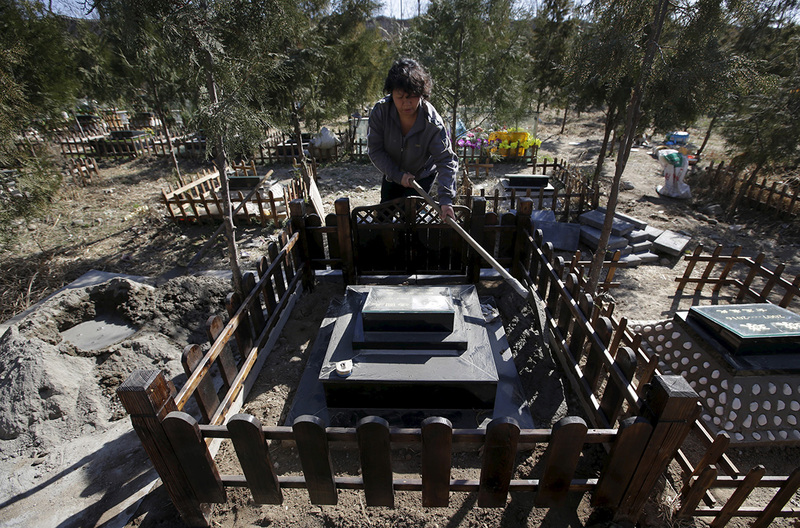 Pet owner Qingqiu gestures to her dog, Little Huoban, after she cleans the tomb of her dog that passed away. 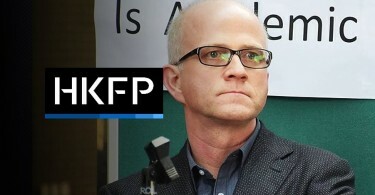 Photo: Jason Lee/Reuters. 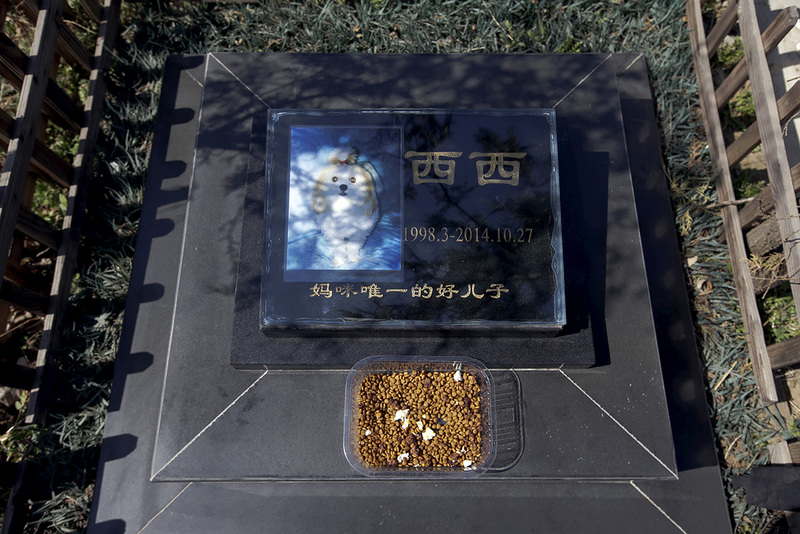 Qingqiu was among tomb-sweepers at one such Beijing cemetery to pay tribute to her fluffy Pomeranian “Huoban”, who died at the grand old age of 15. 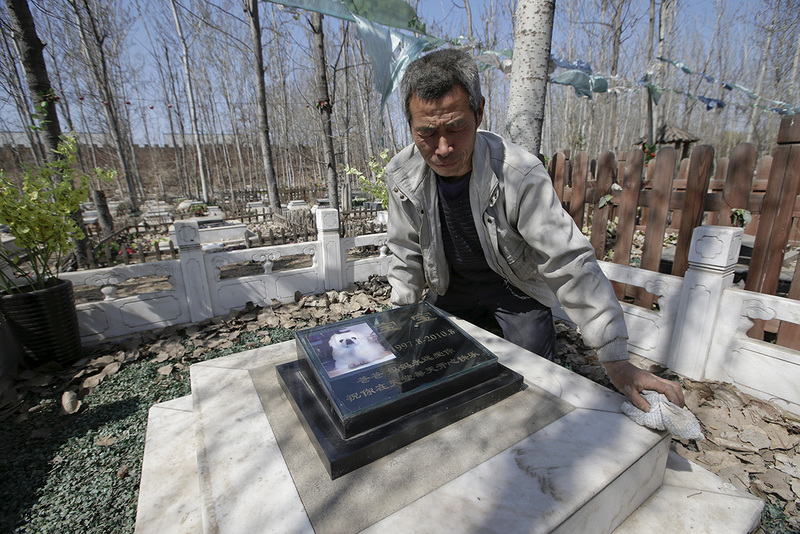 Zhang Youwang, who works at the Baifu pet cemetery, cleans the tomb of a pet dog Baobao, ahead of the Qingming Festival. Photo: Jason Lee/Reuters. 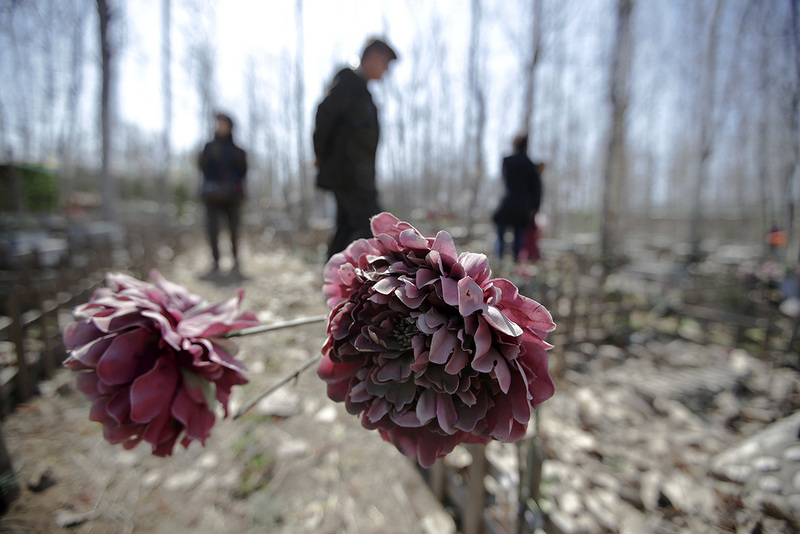 “It’s like a heaven for pets,” Qingqiu said of the Baifu Chongwu Tiantang cemetery, or “Hundred Fortune Pet Heaven”. Food is placed on the tomb of pet dog Xixi at Baifu pet cemetery ahead of the Qingming Festival on the outskirts of Beijing. Photo: Jason Lee/Reuters. 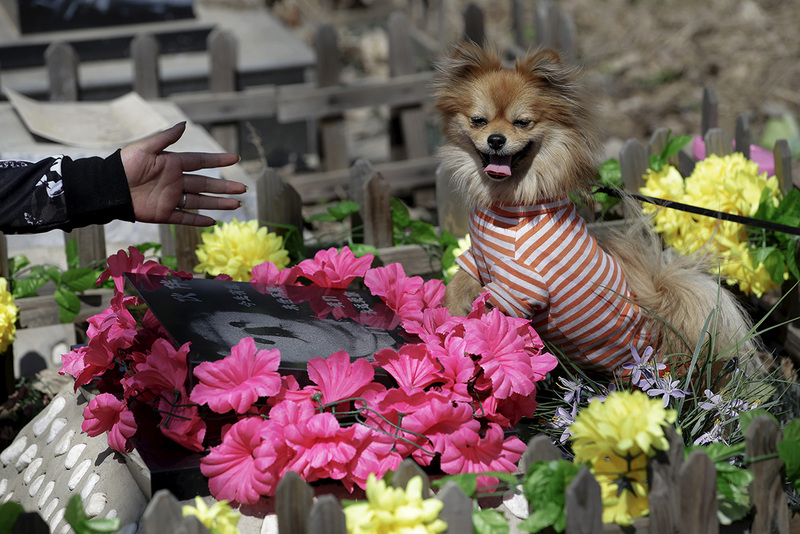 A pet owner and her relatives set up decoration flowers for her pet dog Li Naonao at Baifu pet cemetery. 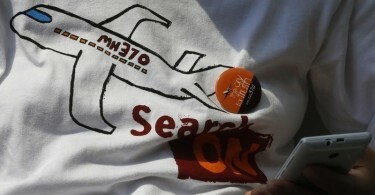 Photo: Jason Lee/Reuters. She said Huoban had witnessed her fall in love, get married and have a child. “I want to meet you again in the next life” is engraved on his tombstone. 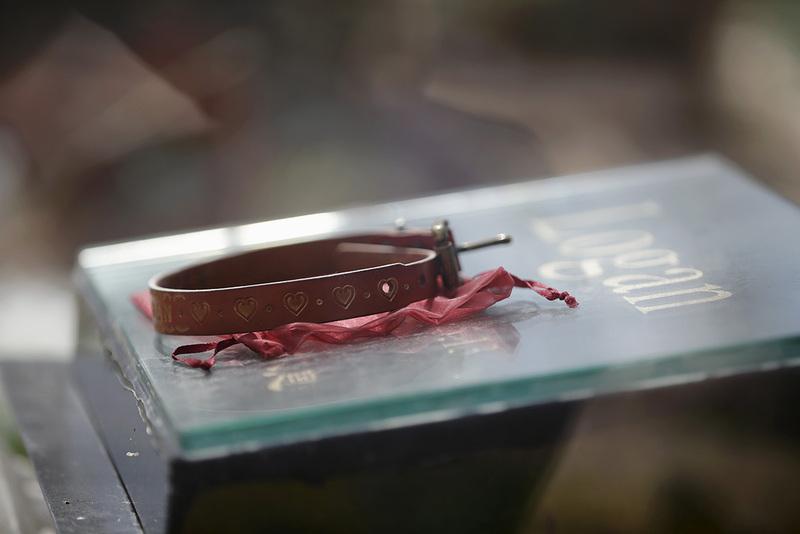 A collar is placed on the tomb of pet dog Logan at Baifu pet cemetery. Photo: Jason Lee/Reuters. 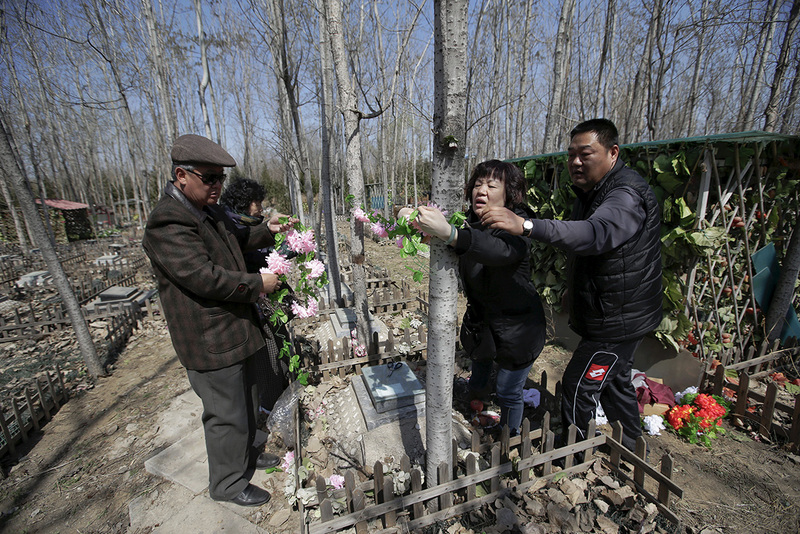 Tian Peiheng, 66, paid respects at her Pomeranian’s grave, along with her husband and daughter. 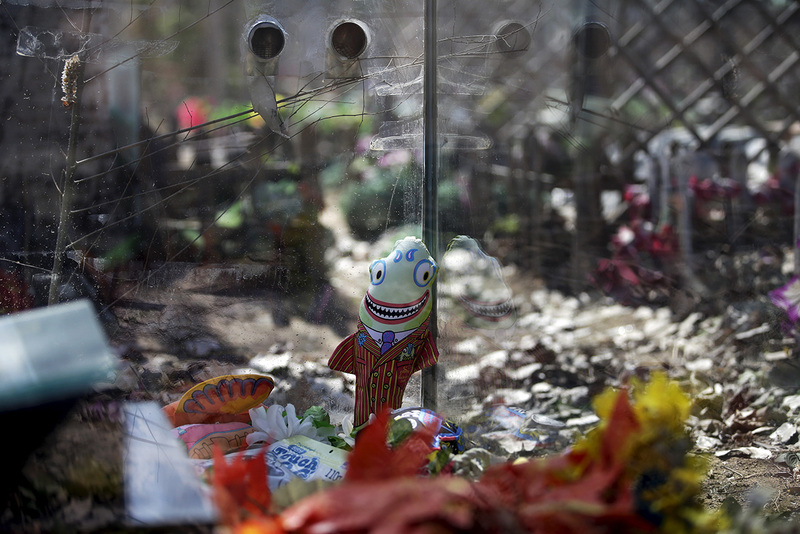 A doll is left at the tomb of pet dog Logan at Baifu pet cemetery. Photo: Jason Lee/Reuters. “I have deep feelings for her… After she was gone, it was just like losing my own baby,” Tian said. 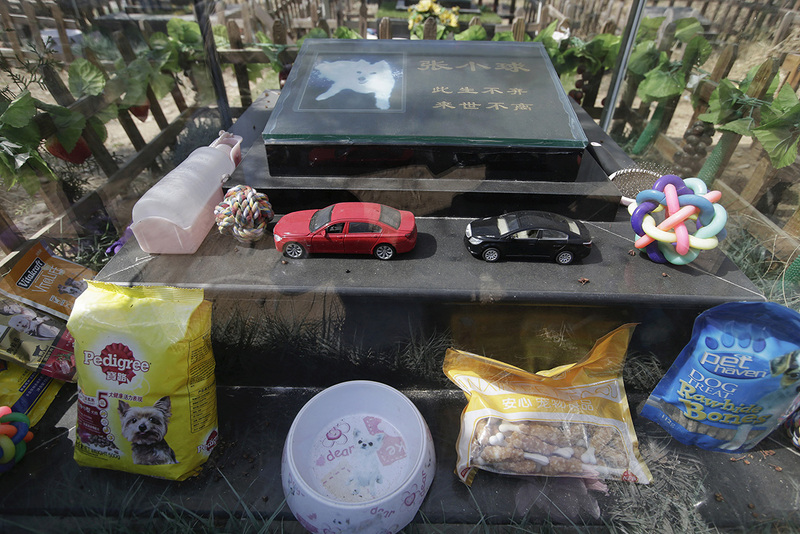 Toy cars, water and food are left around the tomb of pet dog Zhang Xiaoqiu at Baifu pet cemetery. Photo: Jason Lee/Reuters. 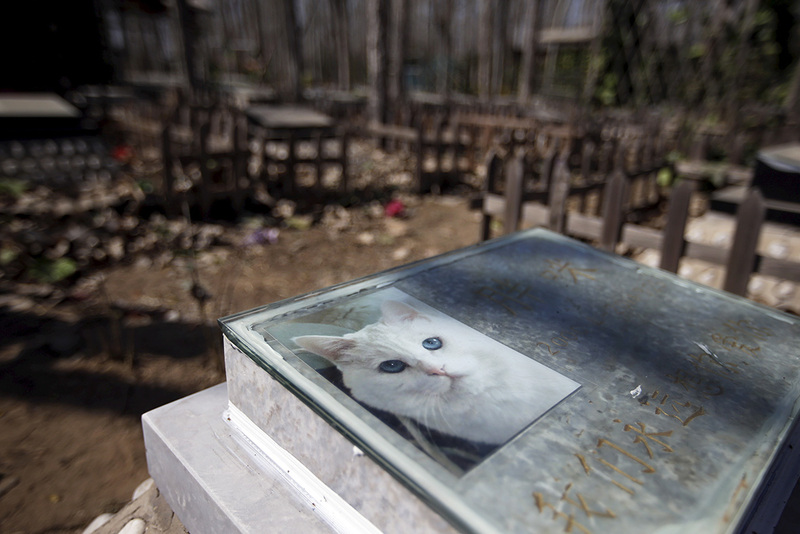 Tomb of pet cat Pangmi, with its picture, is seen at Baifu pet cemetery ahead of the Qingming Festival. Photo: Jason Lee/Reuters. 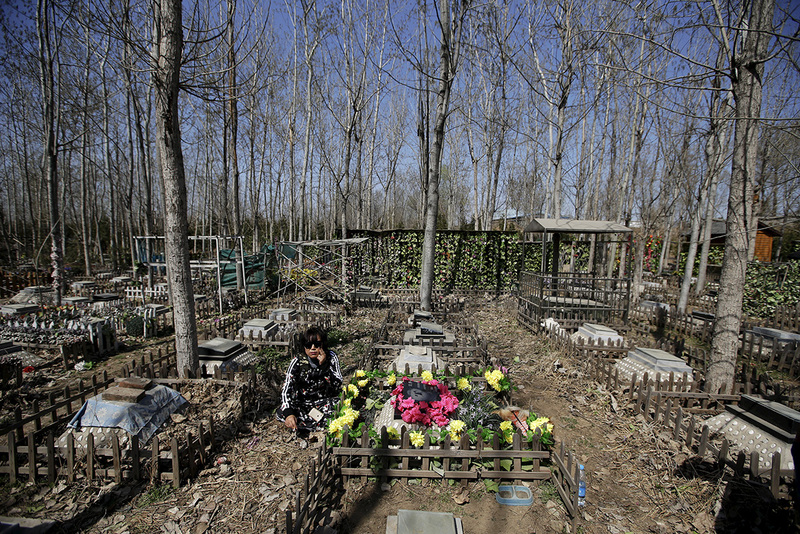 Pet owners walk among graves at Baifu pet cemetery ahead of the Qingming Festival on the outskirts of Beijing. Photo: Jason Lee/Reuters. 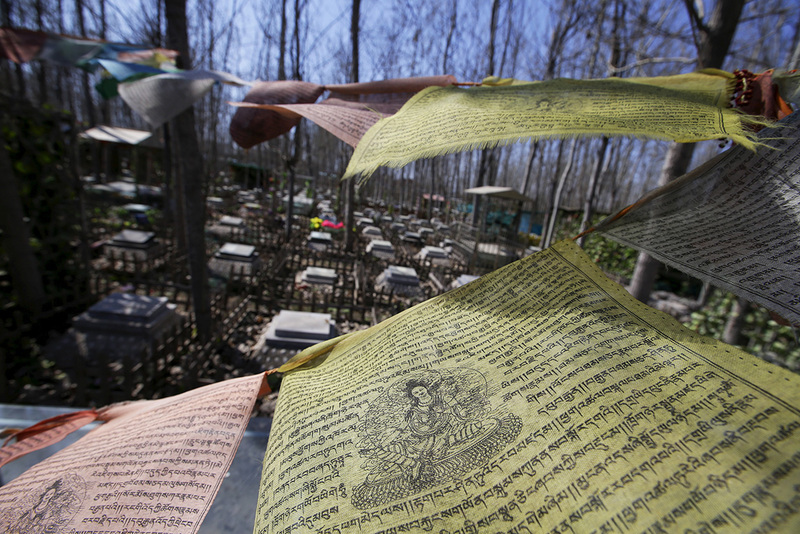 Tibetan prayer flags wave above a tomb at Baifu pet cemetery ahead of the Qingming Festival. Photo: Jason Lee/Reuters. 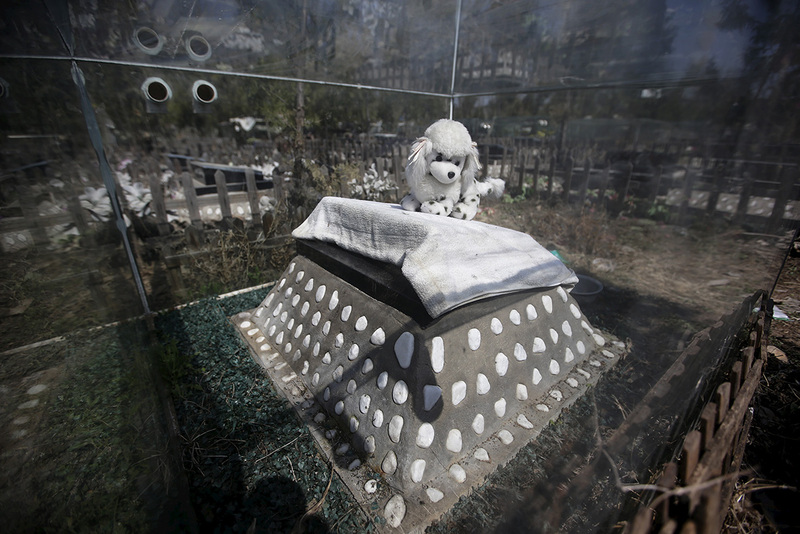 A toy is placed on top of a dogs tomb ahead of the Qingming Festival at Baifu pet cemetery. Photo: Jason Lee/Reuters. 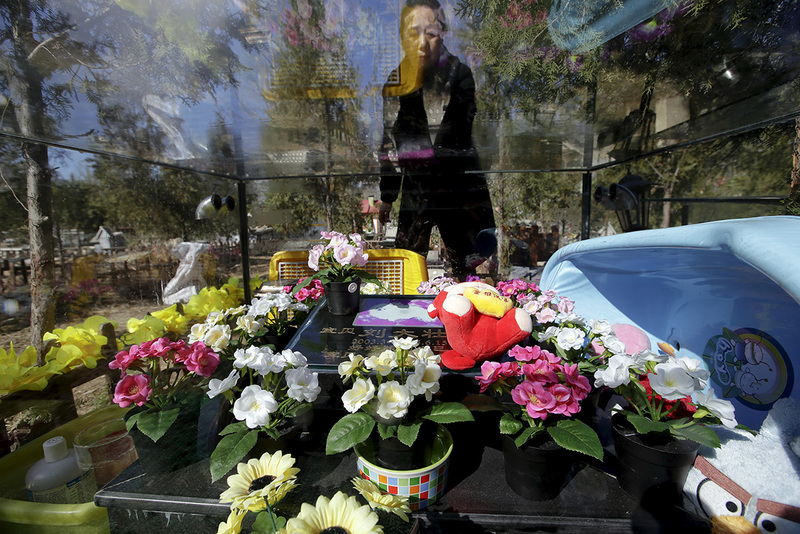 Pet owner Ma Ying cleans the glass covering her dog Liu Dazhuang’s tomb, with bathtub, dolls and decoration flowers placed inside. Photo: Jason Lee/Reuters. A pet owner stands next to a tomb. Photo: Jason Lee/Reuters. China’s growing middle class has started to fight what it sees as barbarous abuse of man’s best friend. 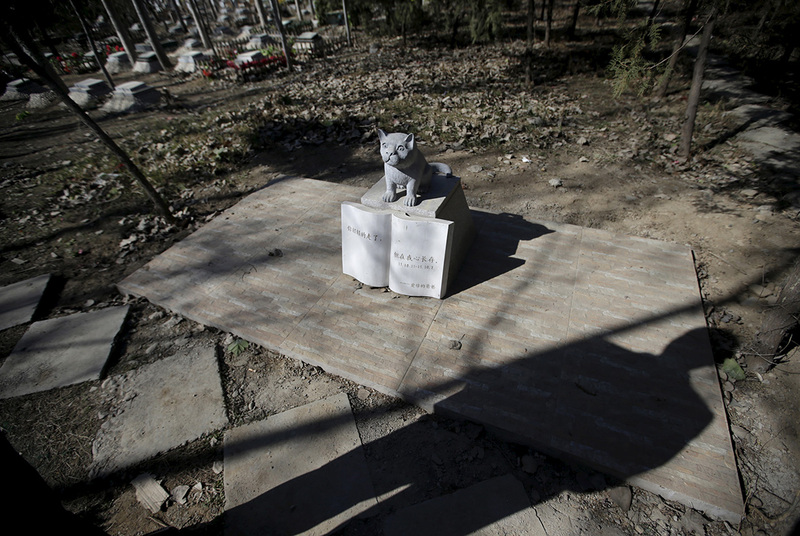 Pet owner Qingqiu sits next to the tomb of her first dog Huoban. Photo: Jason Lee/Reuters. Baifu pet cemetery worker Du Huanying decorates a new pet tomb. Photo: Jason Lee/Reuters. 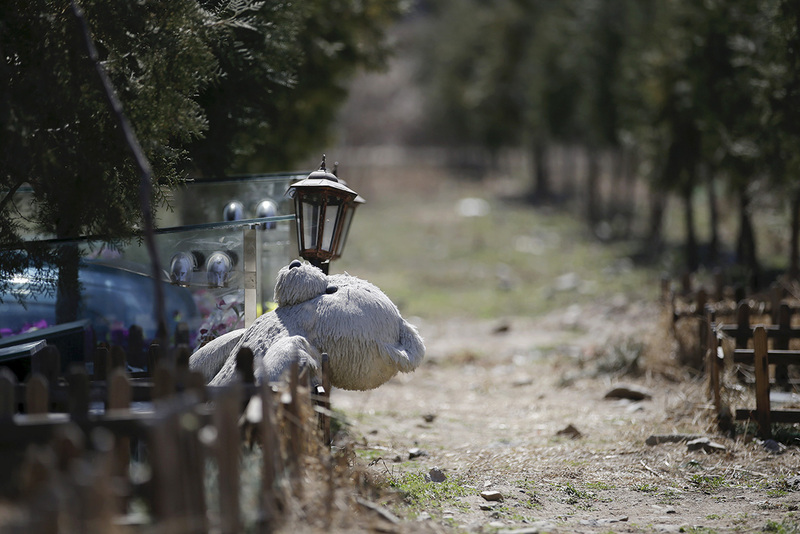 A bear doll is seen beside the tomb of a pet dog ahead of the Qingming Festival. Photo: Jason Lee/Reuters.